Scana Energy is a Sweden company located in Bjorneborg about 300km. from Stokolm. Scana Steel Björneborg is one of the world’s leading suppliers of long, slender shafts and other forged steel products. We have the total control over the supply chain Steel plant, Forge shop, Heat treatment, Machine shop & Quality department. In the steel plant we can produce steel with an alloy content up to 12% and with different ingots sizes from a few tonnes up to 75 tonnes. The forge shop is something of a key stage in the production chain. 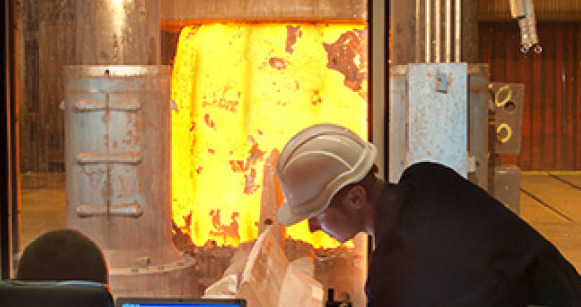 Scana Steel Björneborg has the very best prerequisites: experienced skilled forge workers who have been through a lot to master the art offorging products up to 25 metres long and weighing 45 tonnes. Since 1977, BAZ GmbH together with its Hungarian production plant, TORUS GmbH, has been the specialist for heads, seals and custom pressings in Europe. In a production area of over 20,000 square meters, we have capability to produce hot or cold pressed ends in a range of common materials. Our range of services certainly includes also the forming of special metals, special alloys and their heat treatment from 21.3 mm to 1600 mm. with tickness up to 160 mm. We design, manufacture and test according to TÜV Rheinland a comprehensive quality management system. We constantly store approximately 600 tons of heads in our warehouse in Siegen, the advantage is: quick access to approximately 100,000 heads of all common materials. Bronzitaly s.r.l. was founded in the 1972 with two different operative units: a foundry and a mechanical workshop. Form that time the company has constantly improved its equipment and casting method, which enables the centrifugal cast of ever higher number of special alloys. Now we are a leading Italian centrifugal bronze foundry for special parts as bushings, rings, cylinders, tubes and plates. The mechanical workshop is equipped with several vertical center lathes and state-of-the-art workstations with CNC lathes and several machine tools designed to finish the pieces according to customer’s drawing. We offer made-to-order solutions for your requirements. We perform bending according to your specifications - and we have done this for 90 years. Benefit from our long years of product expertise, manifold manufacturing capabilities, industry-specific approvals and certificates. Established in 2015 by the collaboration with the Geoclima Group, Geoflange S.r.l. inherits the skills of large companies, which have always been projected into the future. Over the years, we have positioned ourselves as a reference point in the precision mechanical engineering industry. This has been possible thanks to a high-quality production system that can be applied in many fields, such as petrochemical, thermohydraulic, mechanical, naval, building, power generation, pharmaceutical and food industry.